A video from Fabian's Tiny Workshop. Over at Fabian's Tiny Workshop YouTube channel I noticed a familiar project this morning. Fabian cut the violin patterns I did a few years ago. He has a really nice YouTube channel so I subscribe to it. You should too. He makes a few changes to the way I designed the project and it come out real nice. He even plays it for you. When you go watch his video make sure you hit the thumbs up button and leave him a nice comment. If you don't already have the pattern you can download it from the download button below. It's actually a very easy project to make. 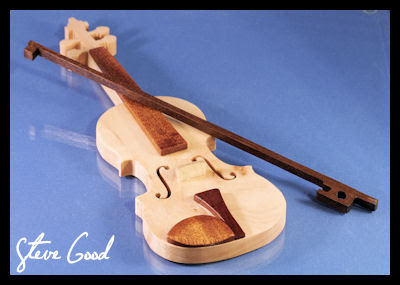 If you know someone who is studying the violin, I bet they would appreciate the gift. By the way did you notice my fancy new download button? I have been working to make the blog easier on the eyes. I have spent the last several days trying to clean up the blogs look and usability. I still have several changes in mind but I'm making progress. If you only read my posts in the email newsletter please jump over to the blog and take a look. My future son in law is a fantastic web developer and programmer. He teases me from time to time about the fact that the blog looks like it was designed in the 90's. My mom always said that "You can't make a silk purse out of a sows ear". They are both right but I am trying to make the sow's ear as pretty as possible. Besides that I like bacon. Hearing protection is critical in the workshop. 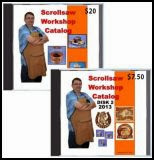 You may not need them while working on the scroll saw but many tools in your shop can and will cause permanent hearing damage. These are getting good reviews on Amazon and are reasonable priced. 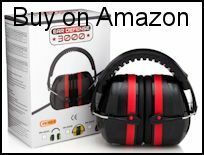 Ear Defense 3000 EN352-1 Adjustable Hearing Protection Safety Ear Muffs. • Lightweight Dura-Design Keeps Ears Cool, Reduces Neck Strain. Won't Break. 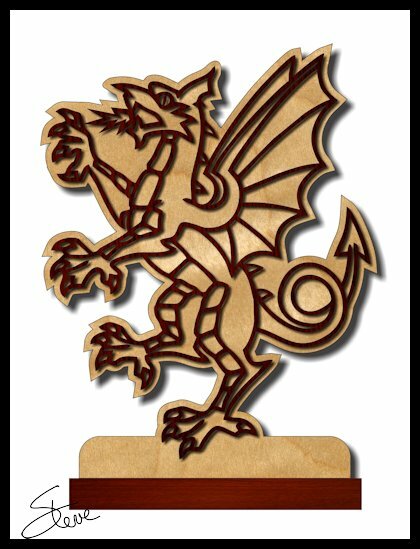 The Dragon Scroll Saw Pattern. This lady is going to stand a bit over 10 inches tall. Do not try to cut her from an open grain wood like red oak. It's probably going to break. When you look at the pattern you will see the lines are about 1/8 inch thick. That's thick enough to withstand the cutting if you use a dense wood and are careful. Once you glue her to the backer board it will be fine. Cherry or Walnut would both be good choices. I set the fretwork and the backer board to 1/2 inch thick in the patterns. I might normally set this to 1/4 inch thick but at this size it is hard to keep wood that thin from warping. Another option would to cut this out of Baltic birch plywood and paint the fretwork a color like red or black and leave the backer natural. I normally hate to paint wood but in this case it might actually add to the project. Your choice. 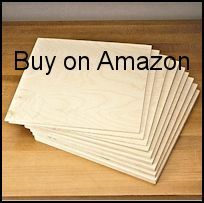 If you are interested in trying Baltic Birch plywood for projects I have an affiliate link at the bottom of this post. 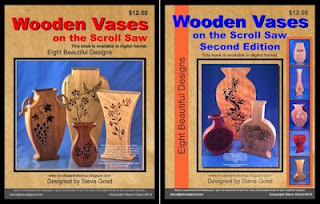 It is listed on Amazon but is sold and shipped by Woodcraft. I often buy this pack just to have a variety of thicknesses on hand for different projects. I am going to start my Custom Christmas Ornament orders early this year. They work pretty well cut from Baltic Birch plywood. I usually cut them from 1/4" thick material. Here is a link to a 24" X 30" X 1/4 sheet of BBP. This is also an affiliate link. I am starting to get several readers ask if I could start taking orders for custom Christmas ornaments early this year. Since I'm now retired from my day job I think I have the extra time to make that happen. I have two of the three designs ready. I still need to design the triple layered ornament. I will try to get that finished in the next few days. After that I have to set up all the order details and I'll get started. The price will be the same as always. $1 per name with a 5 name minimum.